With Kegco&apos;s Deluxe Two Keg Kegerator Conversion Kit, you can quickly and easily go from owning a plain refrigerator or freezer to dispensing fresh-tasting beer straight from the keg with your very own draft beer dispenser! With Kegco's Deluxe Two Keg Kegerator Conversion Kit, you can quickly and easily go from owning a plain refrigerator or freezer to dispensing fresh-tasting beer straight from the keg with your very own draft beer dispenser! 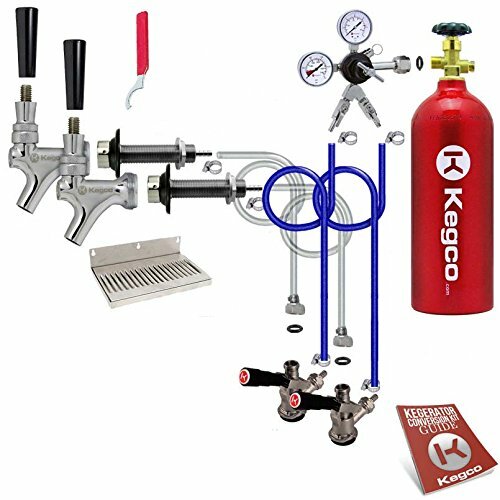 Kegco has drawn on years of beer dispensing experience to design a kit that includes all of the high performance parts you'll need, including a commercial grade two product dual gauge regulator and two NSF approved commercial-grade American D-System keg couplers that will tap any North American store bought kegs. Kegco has even thrown in a stainless steel drip tray that contains drips and spills to make cleaning up after every use just as convenient as the initial assembly. Kegco kits come complete with detailed step-by-step instruction guides. - INCLUDES EMPTY 5 LB. ALUMINUM CO2 TANK: All of our brand new tanks are made from high strength aluminum alloy which is not as heavy as a steel tank and will not rust. These eye-catching tanks have a glossy red coating that acts as an extra layer of protection against corrosion and wear. - LEVER HANDLE KEG COUPLERS: These NSF-approved Kegco KT85D-L D System Keg Couplers feature sturdy nickel-plated forged brass bodies with stainless steel probes, and are designed for use with all domestic brand American D system Sankey kegs. The lever-handle design is easy to use - simply pull out and then down on the handle to couple the keg. A 55-psi pressure relief valve makes this coupler even more convenient to use, allowing over-pressurized gas to escape before it enters your keg. - DUAL GAUGE REGULATOR: Durably constructed to deliver a consistent flow pour after pour, this Kegco 762-2 Commercial Grade Dual Gauge Regulator features a T-style adjustment valve that makes it easy to adjust the pressure inside of the keg. The gauge on top of the regulator indicates CO2 pressure in the keg, while the gauge on the side indicates the remaining volume of CO2 gas. Includes a y splitter and two independent shut-off valves for dispensing up to two kegs at the same keg pressure. - DOOR MOUNT STAINLESS STEEL DRIP TRAY: Our popular 10" wide door mounted drip tray's clean design and reliable stainless steel construction make it easy to enjoy delicious draft beer every day - mess-free! Installation is simple, thanks to the two conveniently placed screw holes on the backsplash. When it's time to clean, the top vent can be removed for easy access. Because this drip tray does not have a drain, you will need to empty it manually.